My name is Jasveen and I am a college student living in America’s post-election reality. I am also a 2016-2017 Fellow of SAALT’s Young Leaders Institute (YLI). In acknowledgment of Giving Tuesday, which follows the Thanksgiving Holiday each year, I want you to know how grateful I am that generous donors support SAALT and this amazing program. With intolerance and even violence targeting our communities and surging nationwide, it is becoming difficult to find safe havens anywhere. Going to school, traveling, practicing my faith, even walking the street in broad daylight now present unmistakable risks to my life. YLI became an important outlet for me and eleven other young South Asian American Fellows who are part of this year’s cohort. It gave us an opportunity to connect with activists and mentors, and explore equality and immigrant justice strategies to implement on behalf of the South Asian community. It has also become a place where I found community amongst like-minded South Asians Americans who are passionate about justice. I also wanted you to know that until recently YLI was funded in significant part by sponsorship money from Southwest Airlines. This year, SAALT made the right choice to end its relationship with Southwest because of multiple incidents of racial profiling by its employees, including against a Muslim university student in California. Speaking on behalf of the rest of my YLI cohort, we greatly admire and respect the bold stand that SAALT took in cutting ties with Southwest, because it meant returning a $10,000 contribution. Taking a stand against large powerful corporations like Southwest showed me what a dedicated organization SAALT is and made me prouder to be in YLI. So today, on Giving Tuesday, a global day dedicated to generosity and charity, I’m asking you to please take the walk towards justice with SAALT and YLI. Please support SAALT and make sure it has enough funds to replace the $10,000 it lost in ending its relationship with Southwest. It’s in your hands now to help make sure that SAALT and YLI can thrive for years to come, and more young adults can get the vital leadership training we need to take on the challenges of tomorrow. P.S. More than ever, our community and our country need young leaders to create the change that we all want to see. Please stand with us today for a better tomorrow. The weeks after the most divisive election in modern American history have left our community shaken. Hundreds of incidents of hate violence and intolerance have been reported since November 8, and SAALT has tracked more than 200 of these incidents even before Election Day. From campuses to places of worship, from airplane cabins to the sidewalks of America, our communities continue to be targets. As we prepare for an uncertain future, we must look to our children to be the ambassadors of change. We must support our young people to help solve these problems. Young adults like Nikhil Mandalaparthy, a student at the University of Chicago who came to Washington, DC as a part of SAALT’s Young Leaders Institute (YLI) 2016-2017 cohort. As a YLI Fellow, Nikhil joined 11 other young people in a two-day convening where mentors and activists took them through workshops and activities to strengthen their leadership skills. This year’s theme was Building Immigrant Justice,and provided the cohort with practical tools and action plans to organize within the South Asian community while spotlighting undocumented immigrant rights. In order for SAALT to continue skills building and community training for these young leaders of tomorrow, we need your support – Today! The need is made even more urgent by our recent decision to return $10,000 in sponsorship funds to Southwest Airlines, money that helped support our YLI program. Southwest employees have been racially profiling South Asian, Muslim, and Arab passengers in the last year, including at least five well-publicized incidents. Southwest ignored SAALT’s repeated demands to address racial and religious profiling in their training guidelines and complaint procedures. Enough was enough, and we said goodbye to their sponsorship. Now we need you! Please step up now as an individual standing for equality and justice. Any amount you can contribute that is meaningful to you would make a big difference. With your help, we can ensure that our future is filled with young leaders who are inspired to work for South Asian justice, and indeed justice for all. Please give today. Southwest Went Low. Help Us Fly High! For the past 7 years we’ve received funding support from Southwest Airlines to help with numerous programs including making the SAALT Young Leaders Institute (YLI) possible. 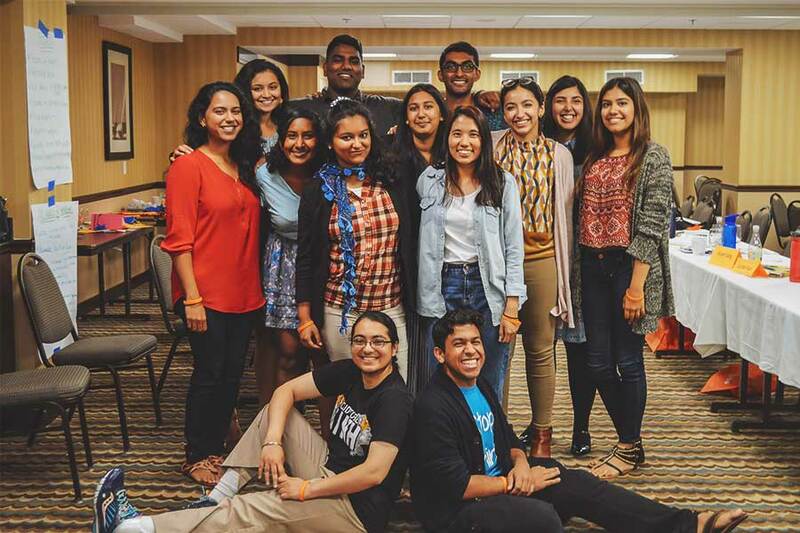 YLI annually brings together undergraduate students and other young adults to build leadership skills, connect with activists and mentors, and explore social change strategies on issues that affect South Asian and immigrant communities in the U.S. Through YLI, we are building the next generation of South Asian community leaders. But because the airline has treated our communities like second-class citizens, we have terminated our relationship with Southwest. Southwest employees have been racially profiling Muslim, Arab, and South Asian passengers in the last year, including at least five well-publicized incidents. One well-covered incident involved kicking a University of California Berkley student off a flight in April 2016 for saying “Inshallah” to his father on the phone. Our decision was not taken lightly nor made in haste. As a non-profit organization, the $10,000 we lost by terminating our relationship with Southwest affects SAALT’s ability to support tomorrow’s leaders through our YLI program. SAALT and our partners sent multiple communications to Southwest, including to CEO Gary Kelly, over the last year expressing our concerns. Disappointingly, all we received was one unsatisfactory response after another. Southwest made it clear they would issue no apology to the affected passengers nor would it address profiling in their corporate training guidelines and complaint procedures. In short, we saw no effort by Southwest Airlines to establish protections against racial and religious profiling of passengers on its flights. The airline continues to deflect any responsibility for its actions, even as the level of hostility against our communities continues to increase nationwide. So we said “enough!” and goodbye to Southwest. Now we need your help to replace this lost funding, and make sure that YLI can keep growing. The 2016-2017 cohort is focused on Building Immigrant Rights, a topic in which South Asian Americans have a tremendous stake. Please help SAALT replace these lost funds, and support tomorrow’s leaders today. Any amount that is meaningful to you will make a difference. We took a stand against hate, against profiling, and for equality when we returned Southwest’s money. We took a stand for your right to fly with dignity. Thank you for standing with us and believing in the work we do at SAALT for and with the South Asian community. Since Southwest went low, we need your support to ensure that our community continues to fly high. Please donate today. South Asian Americans Leading Together (SAALT) – a leading national South Asian civil rights organization representing the diversity of our growing communities in the United States – is profoundly concerned by the findings of the 2015 Federal Bureau of Investigation’s (FBI) Hate Crime Statistics report released this week. The FBI’s analysis revealed 5,850 hate crimes were reported in 2015, a 7% increase from 2014. Two deeply disturbing revelations in the report are the 23% increase in religious-based hate crimes and the 67% increase in anti-Muslim hate crimes across the country in 2015. The FBI’s sobering statistics may pale in comparison to reality, however, as underreporting remains a consistent issue across the country. The number of law enforcement agencies that participated in the 2015 FBI data collection effort decreased from 15,494 in 2014 to 14,997 in 2015, and less than 12% of these agencies even reported one or more hate crimes to the FBI. This means that 88% of participating police agencies reported zero hate crimes to the FBI. Bureau of Justice Statistics studies have indicated that the data reported to the FBI may be as low as 35% of actual levels of hate crime in the country. This is one of the many reasons SAALT developed an online database tracking incidents of hate violence and xenophobic political rhetoric against our communities. Even before the post-election surge in violence, we tracked over 200 incidents from November 2015, and we encourage people to continue to utilize this resource to report incidents against our communities. A welcomed aspect of the FBI’s report was the new addition of categories for crimes targeting Sikhs, Arabs, and Hindus, who have historically been targets of violence due to real or perceived religions and appearance. 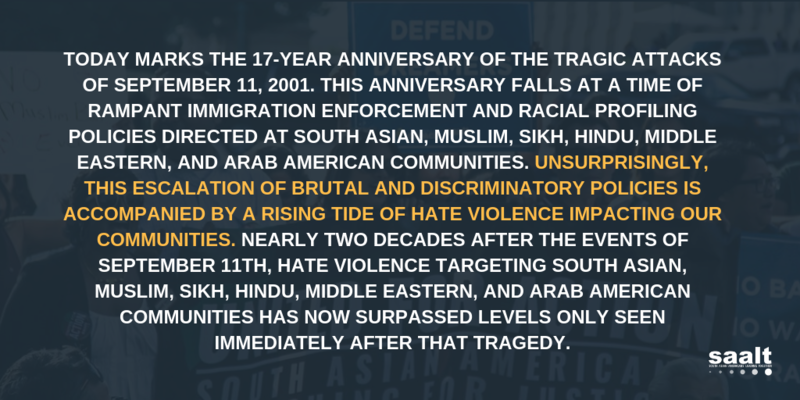 SAALT supported the tremendous advocacy work of the Sikh community following the 2012 Oak Creek, WI gurdwara massacre where a known white supremacist killed six Sikh worshippers. This eventually led to the FBI adding these new categories to help disaggregate hate crimes data more accurately. The alarming data in the FBI’s report and the post-election surge in violence underscore the climate of hate surrounding our communities nationwide. It is high time our communities are prioritized, not as targets, but as Americans, who deserve all the rights and protections available under the law. Gender justice has always been a deep passion of mine, especially as a South Asian woman who grew up in the South. It was while I was in high school in Atlanta, Georgia that I realized I was not receiving comprehensive information regarding reproductive health such as contraception and consent. My school offered abstinence-only education. This has clear shortcomings, which in tandem with the taboo nature of reproductive health conversations within the South Asian community created a culture of ignorance, fear, and avoidance surrounding this very important topic. While I strengthened my understanding of reproductive health in college and beyond, I understood that I was particularly privileged to have this option. So many members of my community did not have this access, and I was not sure how to create pathways to this information strategically or effectively. When I learned of SAALT’s Young Leaders Institute (YLI), I thought this would be an important opportunity for me to learn the tools and strategies to create the change I wanted to see. An important aspect that I explored through YLI was the fact that South Asians are often misunderstood in America to be exclusively upper or middle-class “model minorities.” However this narrative erases South Asians that do not fit into this stereotype, including immigrant women who often lack access to education, language acquisition, a career, financial security, and healthcare, resulting in barriers to accessing reproductive choice. Additionally, negative stereotypes about South Asians contribute toward racial profiling and even violence against South Asian women. For example, in Indiana, only two women to date have been prosecuted under the statewide feticide bill – and both were Asian women, even though Asian women make up less than one percent of Indiana’s population. While a general lack of knowledge about South Asian women’s access to reproductive health and rights may seem like a harmless issue, there are indeed actual victims and consequences. As part of the YLI 2016 cohort, I attended a two-day convening in Silver Spring, Maryland in July. The weekend included several guest speakers, workshops, and activities related to organizing within the South Asian community. In these workshops, we learned about the history of South Asian immigration to the United States, the laws and policies that stimulated waves of immigration into the U.S., the ways that South Asians have experienced increased hate violence after September 11, 2001, and about organized movements against immigrants, South Asians, and Muslims. The session that I enjoyed the most was facilitated by Lakshmi Sridaran, Policy Director at SAALT, and concerned the history of South Asian immigration into the United States. Before her presentation, we placed the year in which our own families immigrated to the United States on a makeshift timeline, which centered all of us in U.S. immigration history. 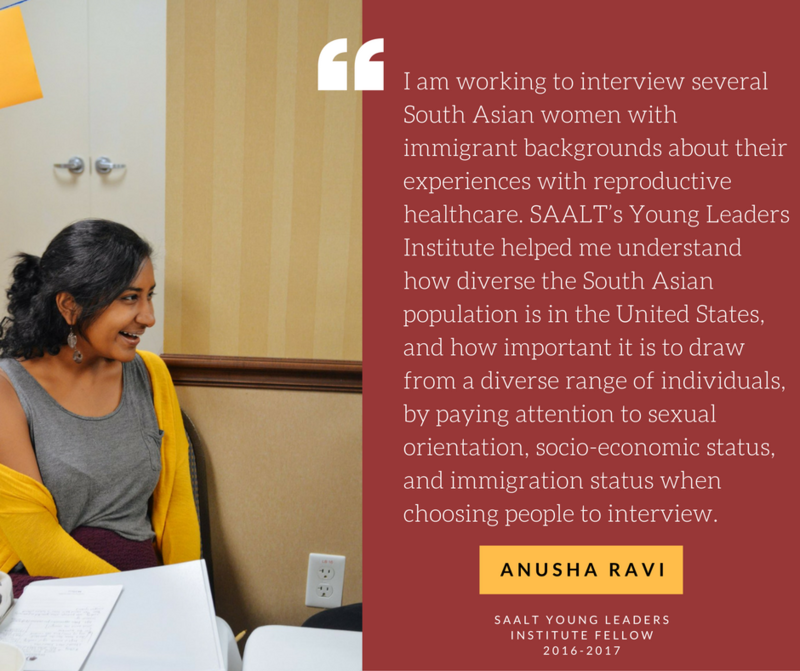 For my project in YLI specifically, I am working to interview several South Asian women with immigrant backgrounds about their experiences with reproductive healthcare. SAALT’s Young Leaders Institute helped me understand how diverse the South Asian population is in the United States, and how important it is to draw from a diverse range of individuals, by paying attention to sexual orientation, socio-economic status, and immigration status when choosing people to interview. While it will be a challenging task for me given the limitations of my own community and who I know, branching out beyond interviewing upper middle-class Indian women will be crucial for my project. YLI also provided me with incredible insight, strategic guidance and helpful techniques to start conducting my project. Although I have always considered myself a feminist and intended to center my project on women, one of the activities during the SAALT convening forced me to realize that I often think about immigrant stories from a male perspective. When prompted to reflect on my mother’s experiences emigrating to America, I realized that I knew far more about my father’s experience than my mother’s. This was an important moment moving forward – I learned that I need to make a conscious effort to center women’s stories in my work. By opening up this conversation at least on a personal level, I hope to enhance my own understanding of reproductive health within the South Asian community, as well as expand the conversation into the community within a culturally competent framework. South Asians are the most rapidly growing facet of the American population, and the opacity surrounding sexuality and reproductive health issues can negatively impact families within the community for decades to come. I am incredibly grateful to SAALT and the Young Leaders Institute for empowering me with tools to begin this exploration. Our nation is still reeling in the wake of the Presidential election. It’s been a challenging time for so many in our community, and indeed for America. Today we want you to hear us loud and clear: SAALT accepts the challenge. We accept the challenge by expressing outrage when the President-Elect, elected officials, and individuals paint our community as a dangerous “other”. We’ve tracked over 200 incidents of hate violence and xenophobic political rhetoric against our community since November 2015. Over 25% of rhetoric came from President-Elect Trump himself. We’re not stopping. We will redouble our efforts to hold the President-Elect accountable when he takes office in January to ensure our community’s rights and voices are defended. We refuse to accept the politics of fear and division. We accept the challenge by knowing we cannot do this alone. In 2016 through our We Build Community Program we’ve provided nearly $50,000 support to grassroots groups in the National Coalition of South Asian Organizations to build a strong field of South Asian groups ready to take their place in racial justice, immigrant rights, and civil liberties movements across the nation. We accept the challenge by understanding our future South Asian leaders of tomorrow must be trained today. 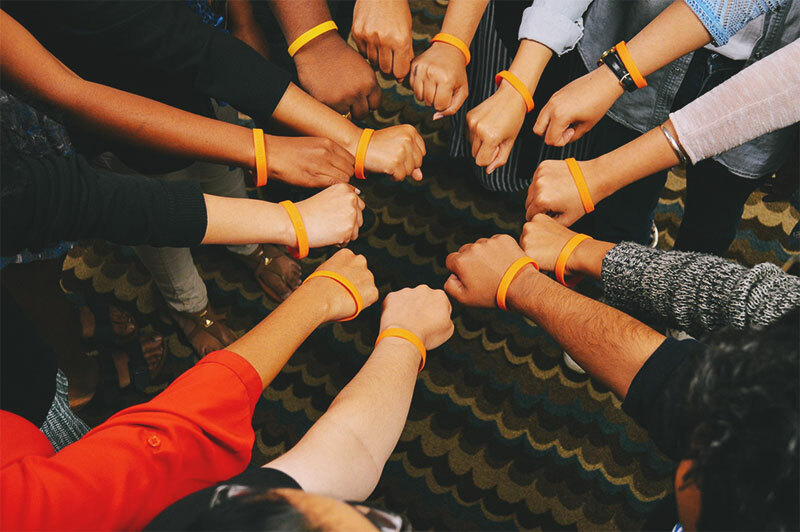 In 2016, through our Young Leaders Institute, we provided twelve undergraduates and young adults the opportunity to build leadership skills, connect with activists and mentors, and explore social change strategies around issues that affect the South Asian community. These young adults are more necessary than ever to lift up the voices of South Asians nationwide. We accept the challenge by knowing the strength of numbers and the power of unity. April 2017 will mark the 10th anniversary of the first National South Asian Summit, our multi-day gathering in D.C. that allows South Asian American community organizations and leaders to strategize on how to unite and strengthen our communities and make our presence known in the halls of Congress. With our country so deeply divided, the 2017 Summit will be the most urgent and compelling gathering of South Asian voices yet. We have big challenges ahead of us, and I know we are up to the task. We’re counting on you to stand with us as we take on this challenge. Together, we’ll make it clear our community is here to stay and that our voices must be heard. 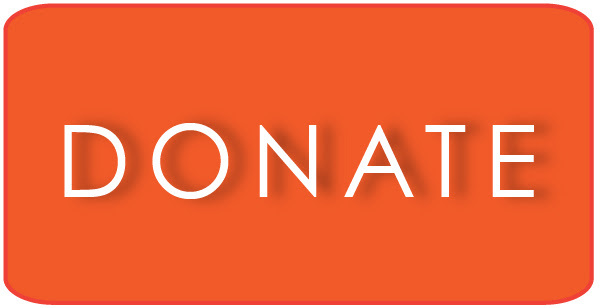 Stand with us by making a generous donation today. We have a long road ahead of us, and we are steadfast in walking every step side-by-side with our community. Friend, we need your support to help us down that road. With you standing with us, we will keep fighting for our community and accepting the challenges that come our way. At South Asians Americans Leading Together (SAALT), we have been alarmed and dismayed by the divisive messages and policies that have typified the election debate over the past year. Our communities, immigrants, Muslims – indeed huge swaths of our nation – have been targeted, scapegoated, and attacked. Our faith and allegiance to the US as well as our very place in the nation has been questioned, yet we are reminded that our communities are vibrant and have a crucial and longstanding place in the US. I am writing to you now to say we will remain undeterred. Today and in the days, weeks, and months to come, SAALT will continue to fight for racial justice, equality, and civil rights for our communities and indeed for all Americans. We pledge to redouble our efforts to ensure everyone, regardless of their race, real or perceived religion, ethnicity, or immigration status can pray in peace, walk in safety, and live with the liberty and equality enshrined in our Constitution. We will hold the line on justice for our communities in Washington, DC and we will chart a path forward. South Asians made their voices heard in many ways this election season, including but not limited to the ballot box. Our voices and our priorities will continue to be necessary in the coming weeks, months and years. We are 4.3 million strong, we are the fastest growing demographic group in the United States, and we have real power. SAALT will continue to work with you, our communities nationwide, and our partners in the National Coalition of South Asian Organizations to unite, amplify the voices of our community and partners, and provide resources to demand our place in this nation. One important way to do so is by connecting with a local South Asian organization in your community, and I encourage you to do so by reaching out to a member of the NCSO close to you. We remain concerned by the prospect of escalating hate violence and xenophobic rhetoric targeting our communities. We’ve heard from many in our community, particularly Muslim and Sikh-Americans, who have expressed concerns for their safety and for their children at this challenging time. We stand unequivocally with you in the face of these attacks and call on policymakers, government agencies, and law enforcement to ensure that our communities are safe, our concerns are heard, and our rights are protected. We need to hear from you about hate violence incidents and xenophobic political rhetoric as they occur. Report these incidents via our database and social media using #TrackHate. Finally, we know many of you may want to be in community with other South Asian Americans nationwide. SAALT is ready and willing to provide a space for this national conversation – join this dialogue by reaching out to us on Facebook, Twitter, and our website by using the hashtag #ConverSAsian. Our country is deeply divided, more than we had thought. Yet we grow even more united in response. We ask you to join us – the time is now to begin the work of the future. 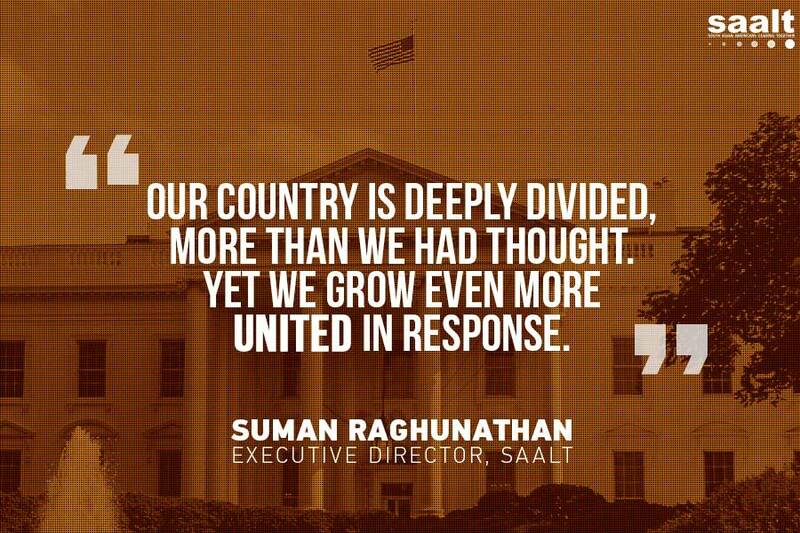 South Asian Americans Leading Together (SAALT) joins our community and much of the nation in grappling with the results of one of the most divisive, anti-immigrant, and xenophobic election campaigns in modern American history. We call on President-Elect Trump to immediately renounce the hate-filled rhetoric used throughout his campaign and commit to safeguarding the rights and freedoms of all Americans, including the 4.3 million South Asians living in the U.S.
We’ve heard from many in our community, particularly Muslim and Sikh Americans, who have expressed concerns for their safety in the wake of the elections. Unfortunately, these fears are not misplaced. SAALT has tracked a disturbing uptick in hate violence and xenophobic rhetoric against our communities in the last year, with 200 instances occurring across the country since November 2015. Of the over 80 incidents of xenophobic rhetoric we’ve tracked, over 25% have been statements by the President-Elect, including calling for a “complete and total shutdown of Muslims entering the United States”. Our nation as a whole and our communities deserve better. We call on the President-Elect to partner with SAALT and the National Coalition of South Asian Organizations to prevent, detect, and respond to bias-motivated incidents of violence, and to denounce any hate directed at our communities. The new administration must also abandon the anti-immigrant and anti-Muslim rhetoric that were hallmarks of the campaign. Statements about “building a wall”, using a “deportation force”, and “extreme vetting” must be categorically renounced. The President-Elect must instead prioritize engaging members of Congress to create a roadmap to citizenship, preserve family-based immigration systems, and put an end to the draconian immigration enforcement policies currently in place. With 450,000 undocumented Indian Americans alone, South Asians have a tremendous stake in fixing our broken immigration system, and we call on the new administration to pass immigration legislation that will defend our rights and expand opportunity for immigrant families. If the President-Elect governs in the manner in which he campaigned, he must be held accountable to the law and to the people of our country. Making America Great is only possible by making America better, day by day, together. SAALT stands ready in this important endeavor and remains undeterred in our demand for South Asian equality. SAALT relies on your financial support to advocate on behalf of the South Asian community nationwide. Please consider making a donation today. An investment in SAALT is an investment in South Asian rights. We are a 501c (3) non-profit organization.